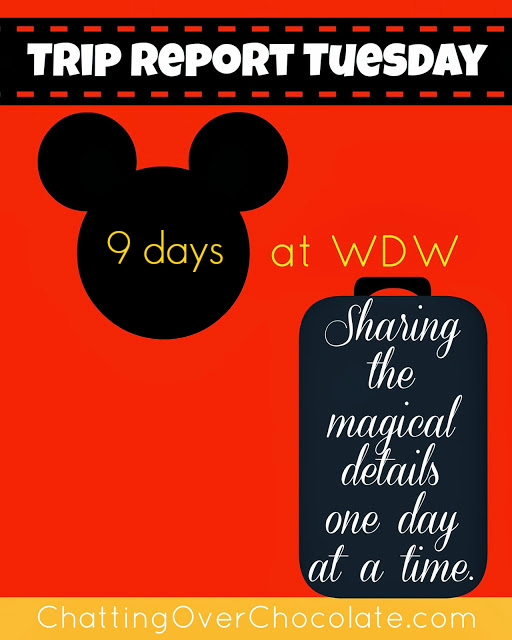 Welcome to a fresh new installment of my Trip Report Tuesday blog series! 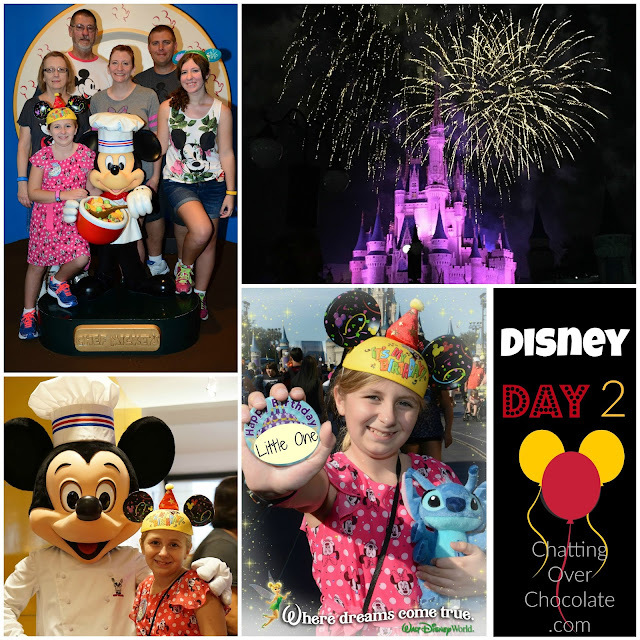 I'm so excited to relive the memories and magic of our most recent trip to Walt Disney World, and share the highlights with you all! Thanks again for everything, Kenny, Ann, & Emily! I only wish I could've fit you in our luggage and brought you along with us! Can you tell how EXCITED we all were? This was a day we'd been counting down to for over a year! It would be a day filled with special firsts, and surprises that some of us didn't even see coming! 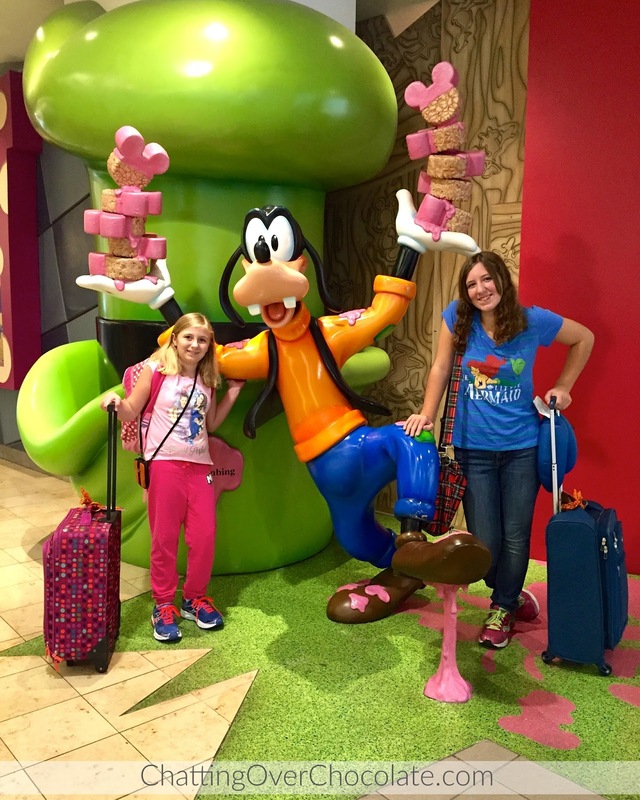 We've been snapping this traditional airport photo with Goofy for years now! One thing on the tip top of my parents' wish list for this trip was to visit the ocean. When deciding which beach we'd visit, my thoughtful hubby came up with the best idea! 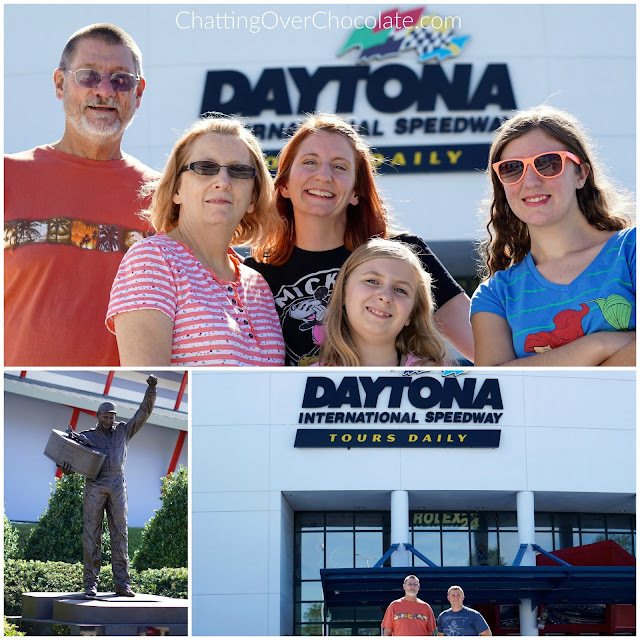 We'd plan to head to Daytona Beach, because then we could surprise my dad with a tour at Daytona International Speedway! This was a very hard secret to keep, but we managed to, and boy was he surprised! This may not have involved Disney, yet the moment felt pretty magical! Did you know that just after the champagne and confetti fly in celebration of each year's Daytona 500 win, the car is taken from its' driver and kept in the museum here for a year? It was pretty cool seeing the car seemingly frozen in time in that moment of victory! Of everyone in our group, Jason was the only one of us who'd ever step foot in the ocean! 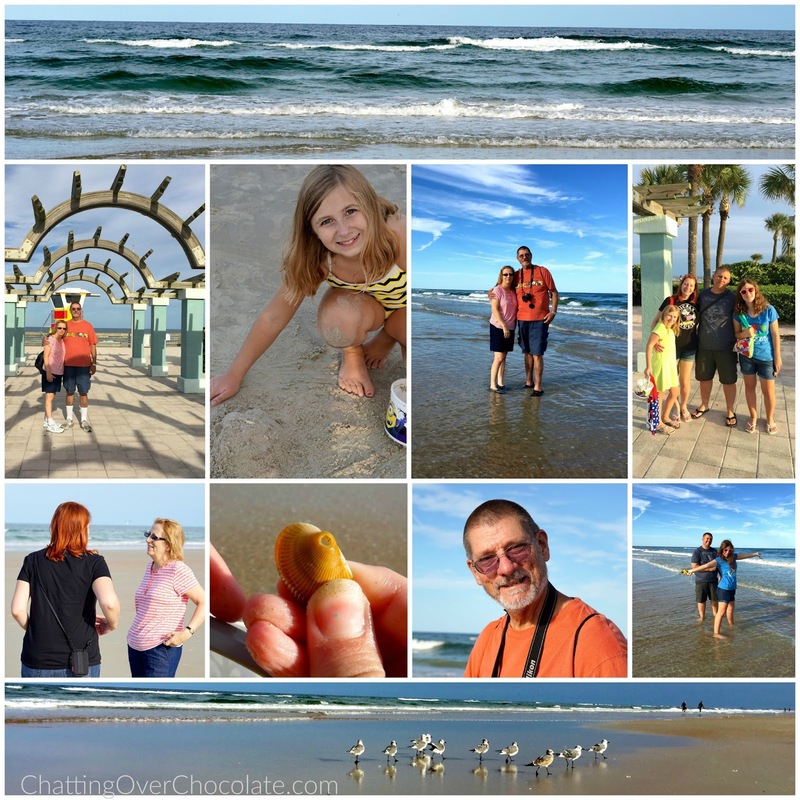 That's right, this was my 9th Disney World vacation, but the first time we'd ever strayed from the magic long enough to take in the beauty of the ocean! As we packed up and prepared to head out my dad told me that he'd waited his whole life to see the ocean and now he has. It was beautiful to see a dream come true before we had even made it onto Disney property! I knew this would be a trip we'd remember and cherish for the rest of our days! We grabbed some treats and hit the road, ready to return our rental car and hop onto Disney's Magical Express! 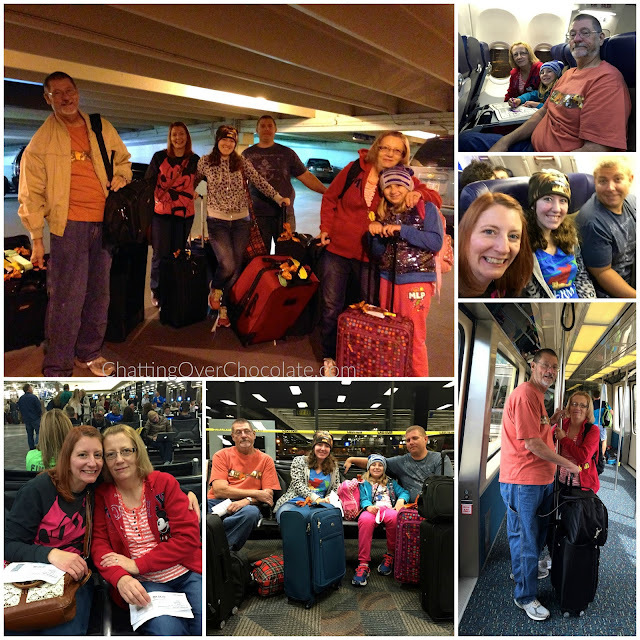 We checked into our home for the weekend (before our week at Animal Kingdom Lodge.) I'd really looked forward to our time at our favorite value resort, especially because I knew my dad would love the theming of our Cars Family Suite! The living room area featured a pull out couch. The table shown is actually a murphy bed that folded down for the kiddos to sleep in! As always with Disney the theming was very well done and made for a fun stay! Then it was time to try to get some sleep before our first day in the Disney Parks, which also happened to be Little One's 11th birthday! The excitement and anticipation level was at an all time high that night! Hope you'll be back to hear about Day 2, next Tuesday! A little sneak peek of the next trip report! Day 2 included an in-suite birthday party for Little One, a celebratory dinner at Chef Mickey's, the birthday girl's favorite attractions at Magic Kingdom, and more! 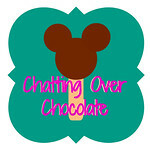 For more pixie dusted posts, you can now find my family's Disney YouTube channel, Eat, Sleep, Dis, Repeat on Instagram and subscribe here for NEW Disney videos weekly! 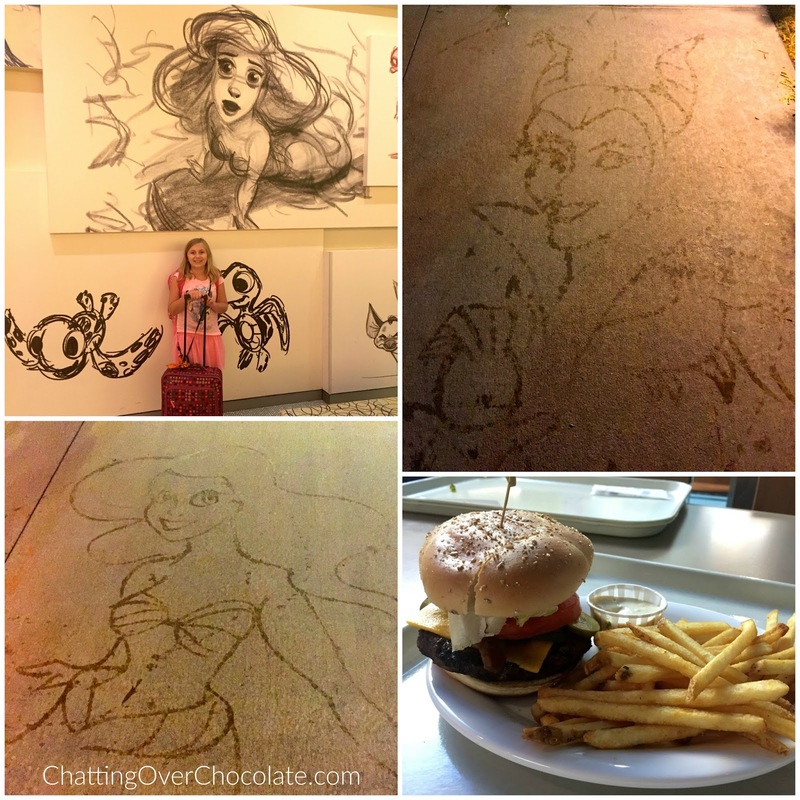 A good dash of Disney also makes its' way onto my personal/blog Instagram account as well. Hope to see you there! Yay Disney trip days! I can't believe you guys hadn't made it over to the beach before. That is such a great memory to make as a family. Disney does details so well, love your Cars family suite! Excited to hear about day 2...I think this was the day I was there as well. Yup 17th! I had to go double check. This is fabulous! We were looking at staying in that resort for our next visit - it's so cute! SO fun! I've never toured Daytona, but I'm a huge Nascar fan and remember well the day Dale Earnhardt died during the 500. I can't wait to hear more about your adventures! 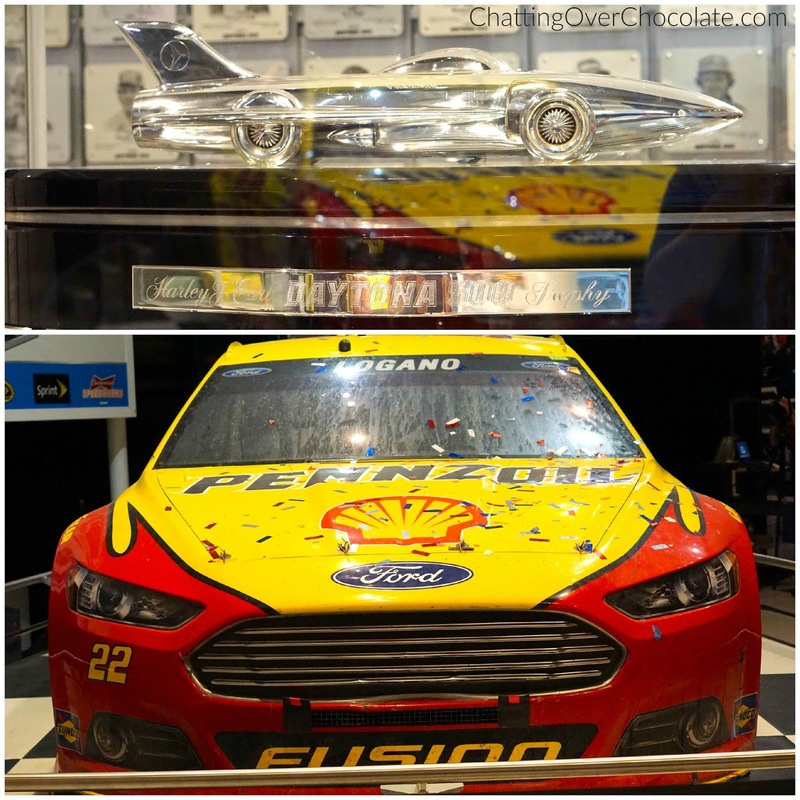 I had no idea that Daytona took the car and you can see it with the confetti on it - so cool! That Cars suite looks so cool :) Sooo excited for these recaps each week! I have always wanted to tour Daytona! I'm a huge fan of Dale Earnhardt Jr!! Oh you make me want to hope on a plane and go like right now! Love seeing all of these smiling faces! And how wonderful that you all made it to the beautiful beach! Looking forward to hearing about the rest of your adventure! Looks like y’all had a blast! So sweet of your aunt, uncle and cousin to drop y’all off! 1) I'm dying to know what the surprise from your aunt is! 3) I almost teared up when I read that your dad told you that he'd been waiting his whole life to see the ocean! I guess being from Southern California, it's hard for me to fathom that some people NEVER see it! 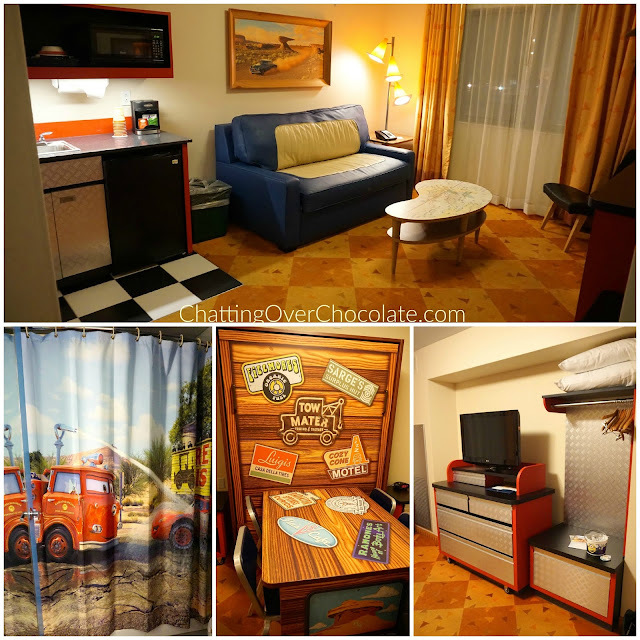 5) The Cars themed room is so neat! 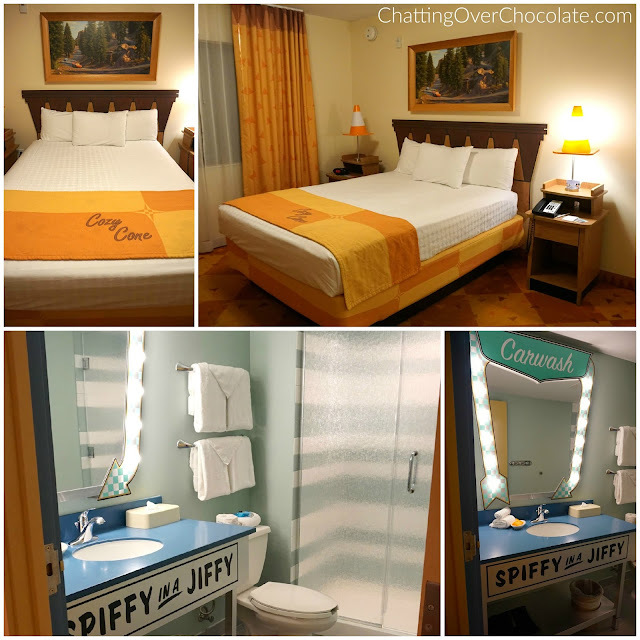 I like that "spiffy in a jiffy" bathroom! So cute! OK - kind of got misty a few times reading this post!! 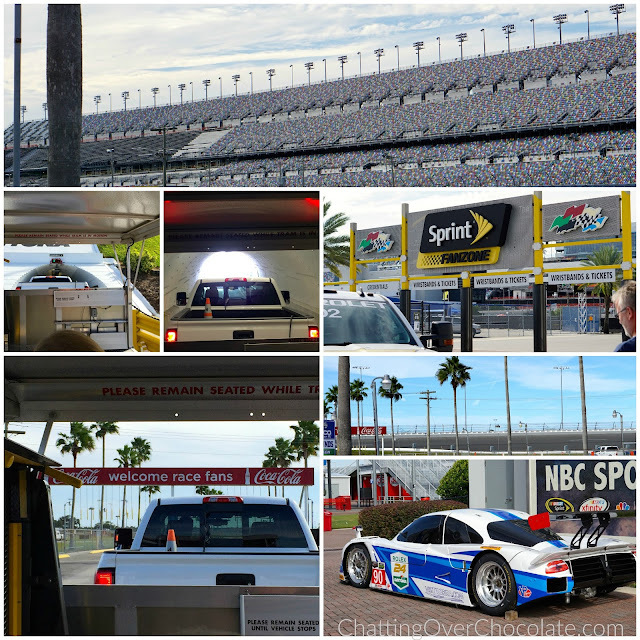 1) Love the sweet surprise of touring Daytona Speedway. How awesome!! 2) Your dad saying he'd waited his whole life to see the ocean. Tears! 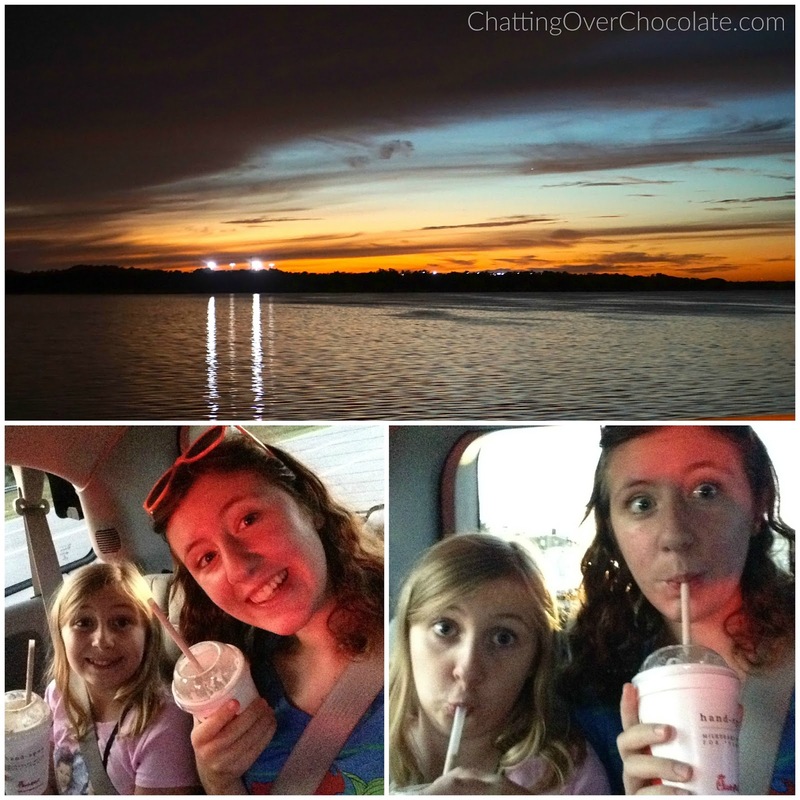 What sweet memories from just day 1! I haven't heard of the Art of Animation resort so I'm looking into it. I'd love to do a Disney trip! There is nothing like seeing the ocean for the first time!!! And what a wonderful surprise for your dad! It's clear how special everything was to you guys. Love this post, friend!!! I'm so glad everything went well. So cool! How far was Daytona Beach and the speedway? This may be the ticket to get my parents to Disney! My dad would love to go see the track and the beach! So excited to keep reading on all your adventures!!! I LOVE that you surprised your dad - so sweet! I can't believe this was your first time to the ocean! It's relatively close for us and always forget that it's not such an easy trip for those toward the center of the country! Glad you enjoyed Daytona! That Cars suite is pretty amazing - Disney certainly goes all out!